When Jane Austen’s parents were married in 1764, the bride, Cassandra Leigh, wore a red riding habit to the ceremony. Cassandra was not being eccentric or making a fashion statement. Such dress was perfectly appropriate for a young woman from a genteel but not particularly wealthy family marrying a country parson. Under such circumstances, the wedding dress was a practical garment, expected to be worn again on many occasions. This explained why black was a general favorite for the lower classes. As for the red wedding dress of the ever practical and thrifty Mrs. Austen, it too was used for many years, before being eventually recut as a riding jacket for her son Francis. Bridal attire in 18th century France was much the same. White was a mourning color, and brides would wear it when they had recently lost a close relative. Otherwise, they dressed in their best finery, and color was a matter of taste and fashion. 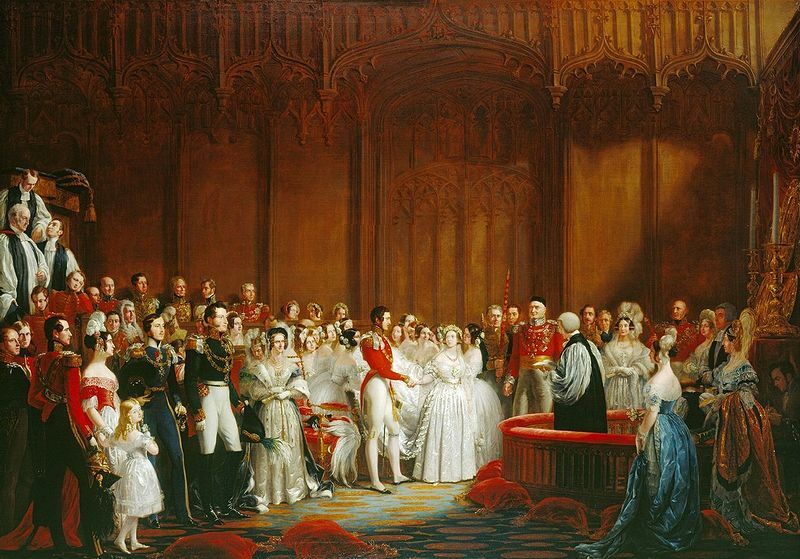 But when in 1840 Queen Victoria married her first cousin, Prince Albert of Saxe-Coburg and Gotha, all of this changed. The wedding was of course a momentous occasion, both politically and in terms of fashion. The bride wore a gown of white satin, trimmed with white lace matching her veil, and a crown of orange blossoms. 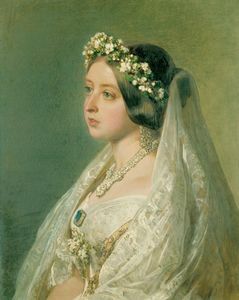 The only spot of color was the beautiful sapphire brooch Albert had given her as a wedding present, clearly visible on this portrait by Winterhalter. To learn more about the ceremony, see Elena Maria Vidal’s remarkably detailed post at Tea at Trianon. Queen Victoria was a trendsetter in this regard and soon white became de rigueur for wedding gowns, at least among the upper classes. In France, though, more practical colors remained popular for those of modest means. My grandmother kept all the wedding pictures of her family, friends and servants, and I remember noticing, as a child, that the latter were easy to identify because the brides wore black gowns, well into the 20th century. As often, my personal tastes tend towards the 18th century, and I very much like wedding gowns in soft, cheerful colors. What about you?